When someone sends you by email an Excel spreadsheet file as attachment, how to preview the content of the file depends on the email program you are using. In Outlook 2007, you will find a special functionality and integration with the rest of the Office 2007 suite, which actually allows you to preview an attached Excel file right from Outlook, without having to actually open it or save it. Note that this assumes that you do have Excel 2007 (possibly another version of the program) already installed on your computer, or at least a compatible Excel file viewer (free download from Microsoft's website). 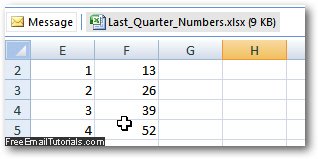 This tutorial explains how to preview the content of an attached Excel file in Outlook 2007. To preview the content of the Excel 2007 spreadsheet without opening or saving it, just click on it: for your protection, Outlook 2007 will first display a warning message: if you trust the sender of this attachment, click on the "Preview file" button. Tip: if you want to automatically load the preview of the attached Excel spreadsheets, without seeing a confirmation message in the future, just uncheck the "Always warn before previewing this type of file" checkbox. As soon as you click on the Preview file button, Outlook 2007 will display the content of the attached spreadsheet right inside the email Reading Pane! This method can also be used (and is most practical then) when you have received multiple spreadsheets as email attachments - it allows you to preview the content of one file after the other, without having to open any of them. This is all it takes to preview the content of Excel files right from your email program; if you decide to keep the attachments as a "standalone" file on your computer, just right-click on it inside Outlook 2007, and choose "Save As" - you will end up with a copy of the spreadsheet in the folder where you chose to save (and the Excel attachment is left intact, still attached to the original email message).